Logan Portable Infrared Quartz Heater is the perfect heating solution for living rooms, dining rooms, bedrooms, kitchen areas, basements, and craft rooms. Plug this electric heater into your wall outlet and immediately enjoy the warmth. Its heat exchanger combines with the humidity in the room to provide soft, moist, safe heat without reducing oxygen or humidity. Supplemental heating up to 1000 sq. ft. This giveaway is open to the Continental US only (because of shipping costs) and will end on November 12th, 2014. Good Luck!! I live in the south so the winters are considerably mild compared to other parts of the country, but we are less acclimated to cold weather as well. We usually start to struggle when the temperature goes below 45 or 50 degrees. Our winter can be cold, cold, cold! I'd love this to help heat our upstairs! I live in the Pacific Northwest where it is damp and chilly all winter. I'd love this to take the chill off the upstairs and reduce the use of our oil furnace. The apartment that I live in New York does not maintain temperature well and the heating system is old and not very energy efficient. 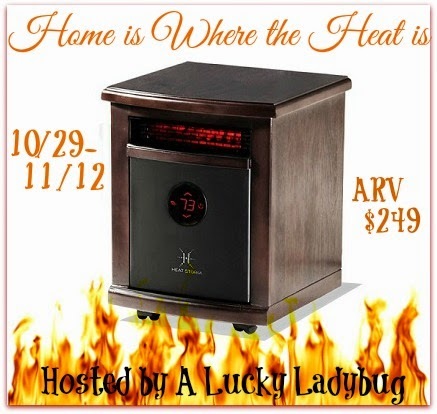 The Logan Portable Infrared Heater would help to keep to us warm while saving us a ton on our electric bill.